Wyoming may be the “Cowboy State,” but Jackson Hole is above all a mountain community. Wrapped by five mountain ranges the valley is known as much for skiing as for its Wild West roots. It’s also a place where the wildlife population is so abundant it outnumbers people. This is what drew David and Karen Landes, both executives in Seattle, here. They came for the recreation, for the rural quiet, for the encompassing beauty. When it came to building a house, in deference to Wyoming’s rare, wild beauty, the couple hoped to preserve as much of the natural character on their property as possible. They determined that they needed something smaller and hopefully erring on the side of sustainable without pressing beyond their budget. Interested in contemporary architecture and design, they interviewed several architectural firms from Washington and Colorado. But when they brought locals Tom Ward and Mitch Blake of Ward + Blake Architects to their property near Wilson, the connection was immediate. The architects understood the subtleties of the property, appreciating the possibilities. They set to work on siting the home so that it would take advantage of the southern exposure and a view often overlooked in the shadow of the Grand Teton. Ward + Blake has built a firm on the principles of designing sustainable, Modernist buildings that integrate respectfully with the land. Tucked into a swell of sagebrush hills, wildflowers and aspen, the house is innocuous in relation to the landscape, successfully connecting with its surroundings. From the entrance of the property the house is demurely revealed, peaking out only a bit from the hillside and not revealing its full footprint until a visitor is inside. From the outside, three windows cut through the concrete form, interspersed with native grass landscaping on the ground and a simple sod roof above. The front door is slatted like the gate of a fence, allowing the warm interior light to filter through the wood as a welcoming boundary rather than a barrier. Compartmentalized for function (living, sleeping and utility), initially approaching the Oatey residence seems functional and straightforward. A three-car garage dominates the protected driveway and a subdued front door beckons. A toss of artistic flair belies the utilitarian greeting with a flying buttress of concrete that edges the home with a scenic view. Step through, the doorway, however, and all will be revealed. Just inside, the home easily transitions to an open living space that washes over visitors as pleasantly as a smile from a friend. Angled toward the light, the kitchen-dining-lounge area exudes comfort. For the interiors, Karen worked with Deanne Brenneis of John Brenneis Architects in Seattle to meld natural materials with the crisp lines of the architecture. The result is a relaxed style, which incorporates light, organic colors with tactile elements of textured fabric: tweed upholstery, suede, leather and soft maple. There isn’t an antler in the house, as David puts it, the landscape is enough to keep the couple entranced. 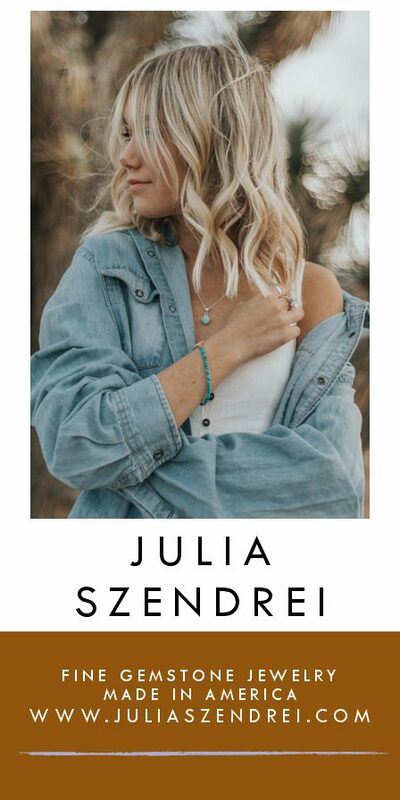 Although their home is nontraditional for the region in many ways, there are also nods to the rustic elements of Wyoming. Utilizing reclaimed fir flooring throughout the house balanced the hard concrete and metal materials, weathered snow fence was incorporated as an accent for the soffits and ceiling. Additionally, in the kitchen area, a breakfast bar is lined with custom-crafted stools made of twisted rebar and antique tractor seats, horseshoes are embedded in the concrete backsplash as a kitschy detail and the semi-circle steel channel overhanging the island for lighting and spatial separation is accented with barbed wire. David notes that he and Karen spend most of their time in this main section of the home. Tucked modestly to the western end of the home is the master bedroom. The ground floor holds a home office and a more intimate seating area that is encased with concrete and steel forms. This marriage of a Modernist palette with traditional materials is a signature style for Ward + Blake Architects. Allowing the grain of wood to show, the landscape to be part of the design and the hints of a rustic influence are combined with practical, efficient construction to create a distinct style. A little bit of the cowboy state and a lot of modern sensibility. “We like to take all the touchy-feely aspects of rustic and compose it into a contemporary vocabulary,” said Blake. Aside from the stunning visual array of the land, the house was also sited for the purpose of energy efficiency. 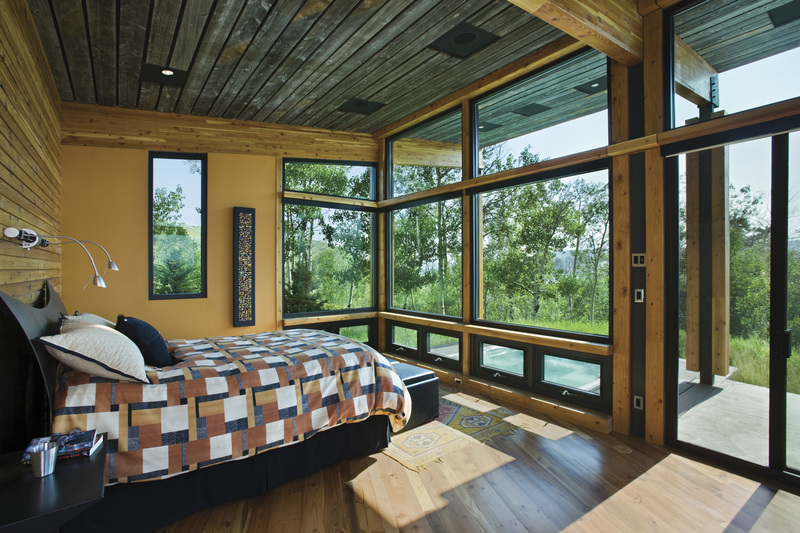 Positioning the majority of windows in the home toward the south allows for maximum passive solar heat throughout the day. 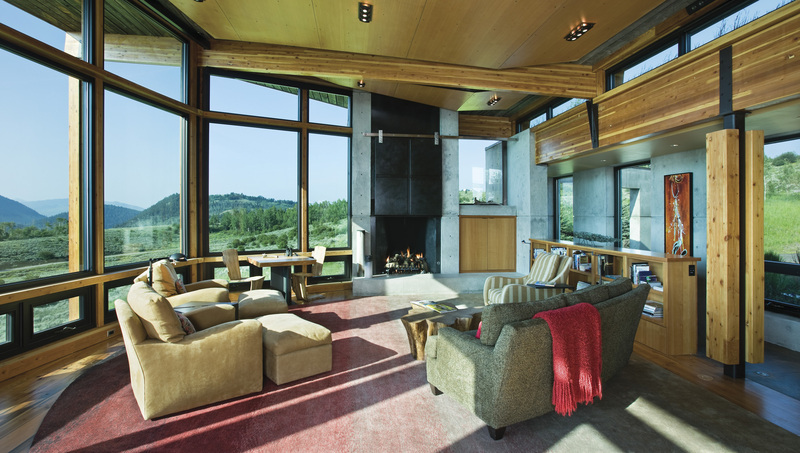 Add the natural insulation of Thermal Mass concrete walls, radiant heat in the flooring, recycled materials and natural finishes on the raw materials and the home is a prime example of sustainable building. When Mitch Blake said he’d bring the outside in, he wasn’t just referring to the view; the phrase is more literal than lofty. While the residence has ample vistas, for Blake, this means incorporating the palette of materials both inside and outside the home. Utilizing wood, concrete and steel throughout the structure, Ward + Blake created a visual dynamic that acknowledges nature rather than obstructing it. Overlooking a neighboring conservation easement in the valley below, David commented that while most homeowners seek out a view of the Grand Teton, he prefers the 180-degree vista of the valley. Each window frames a unique segment of the view and affords a panorama of the day’s changing light. 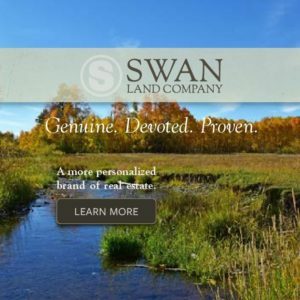 For the Landeses, it’s as close to living on the land as possible, a reminder of what drew them to Wyoming in the first place. Rather than overpower the landscape, Blake’s design effectively enhances it by punctuating the open space with frame after frame of crisp lines and honest materials. “The whole house is a composition of voids that intersect, so that when you hit the corner of a room it blows out into the landscape. It has transparency so that it feels natural and each space bleeds into the next,” expounds Blake. 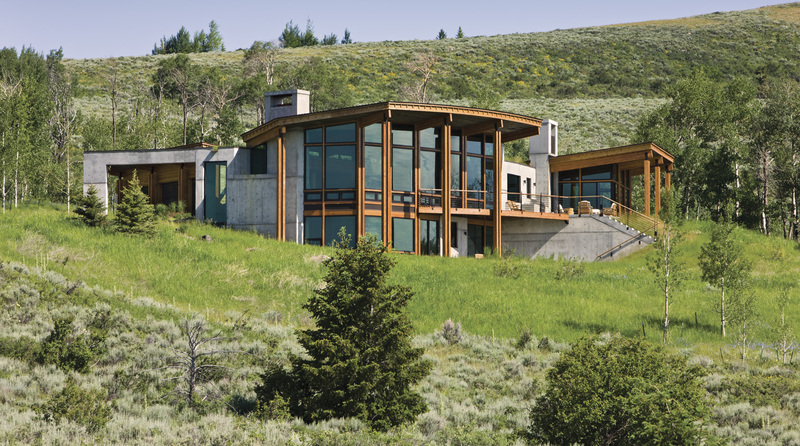 Keeping a small footprint, Ward + Blake Architects designed this Wilson, Wyoming residence with a wall of southern-facing windows that maximize passive solar benefits and blur the line of inside and outside space. 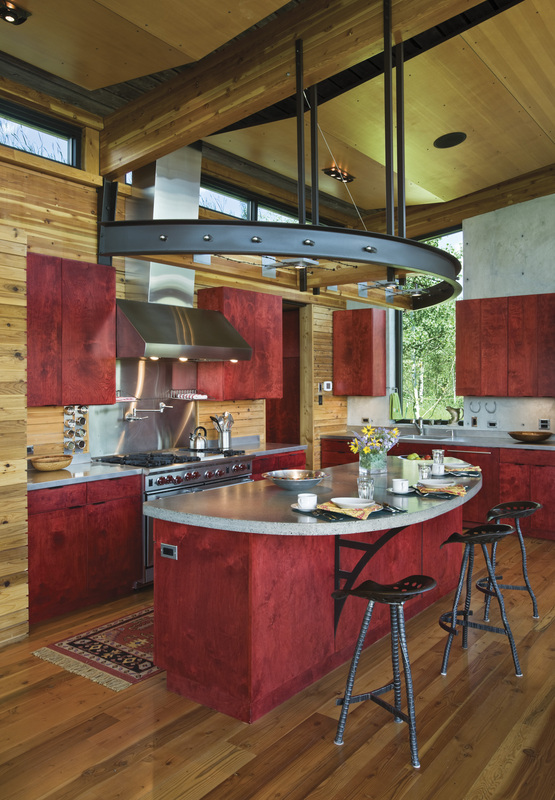 Dyed Baltic birch cabinets add a burst of color to the neutral palette of wood, concrete and steel. 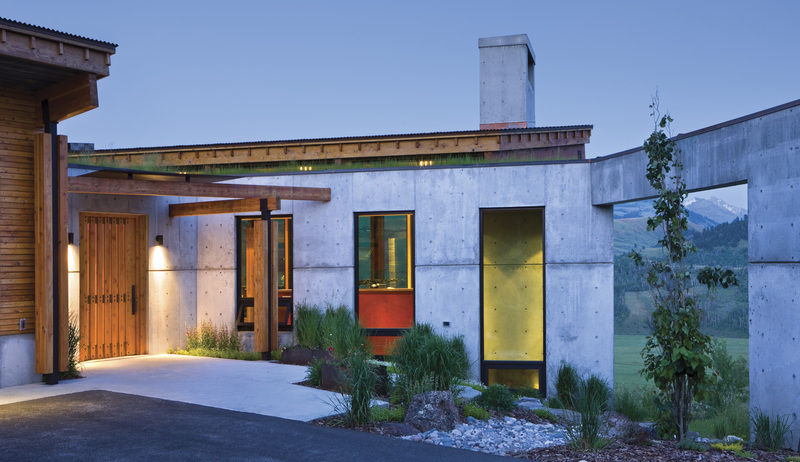 Incorporating energy efficiency as a trademark in all their projects, Ward + Blake Architects utilized Thermal Mass concrete, glue-lam beams, reclaimed wood for floors and ceilings and radiant heat to create a crisp-lined Modernist home. Still incorporating views and passive solar benefits, the master bedroom has a serene quality that contrasts the active main living-dining-kitchen portion of the home. From the entry, the full span of this Modernist home is obscured, offering only hints at the beautiful views that unfold from inside the front door.